I’ve been a professional artist for 34 years. For the first 23 of those, I worked with agents around the globe as an illustrator for clients like Disney, Microsoft and Sony. 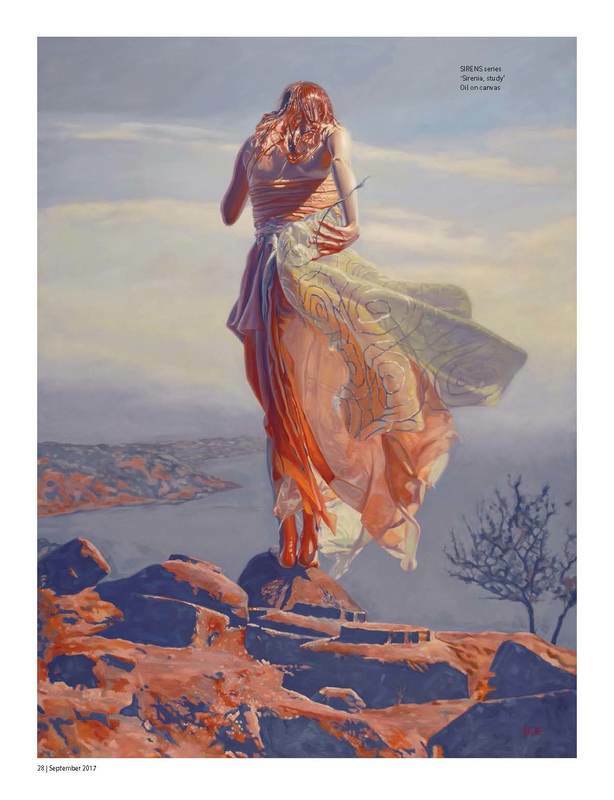 Eleven years ago I decided to take the plunge, and shifted my focus to fine art. 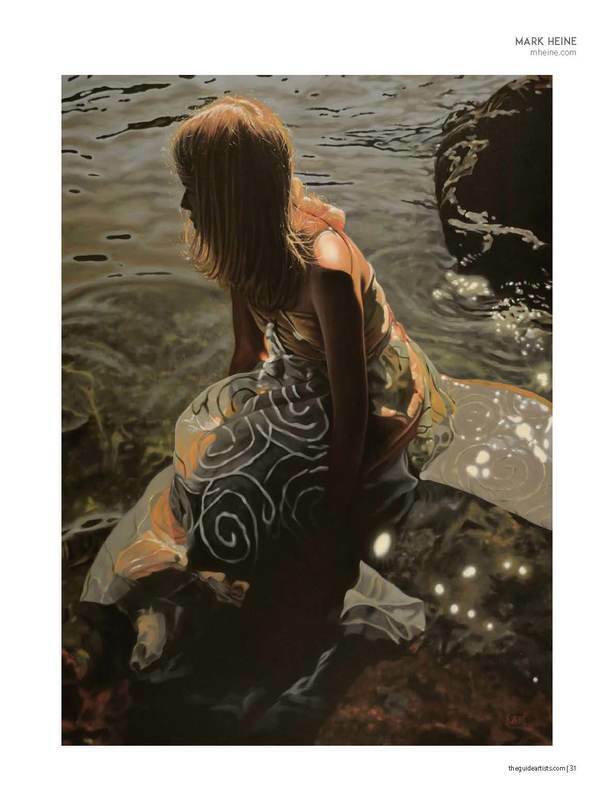 I had a number of successful local solo and group shows in western Canada with work that was mostly figurative paintings of my children and their friends at play in the natural, unspoiled landscape of the west coast. It’s where I grew up, and my family and I care deeply about it. That is why my most recent work tells a different story. I find it personally impossible to sit by and allow corporations and governments – by action or inaction – to threaten one of the last remaining unspoiled environments on this planet by pushing pipelines and pouring billions of dollars into greenhouse-gas infrastructure, instead of investing in sustainable energy. 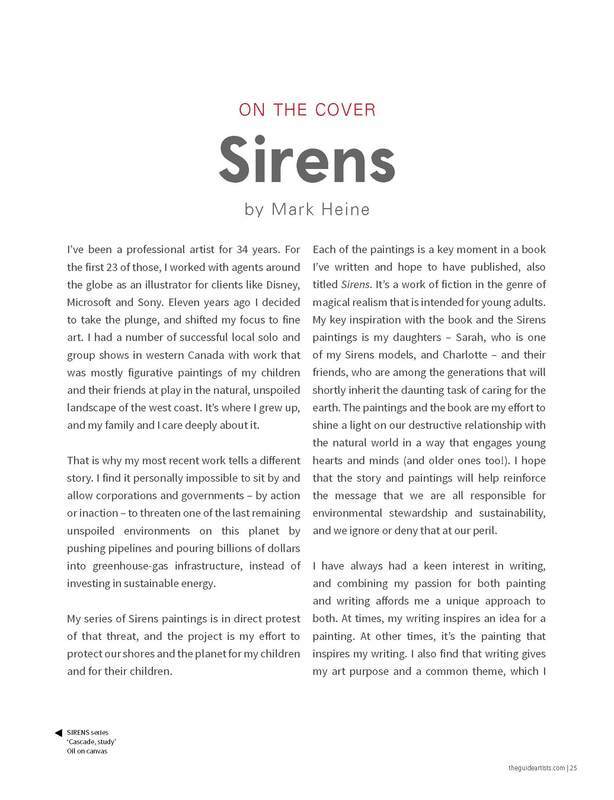 My series of Sirens paintings are in direct protest of that threat, and the project is my effort to protect our shores and the planet for my children and for their children. 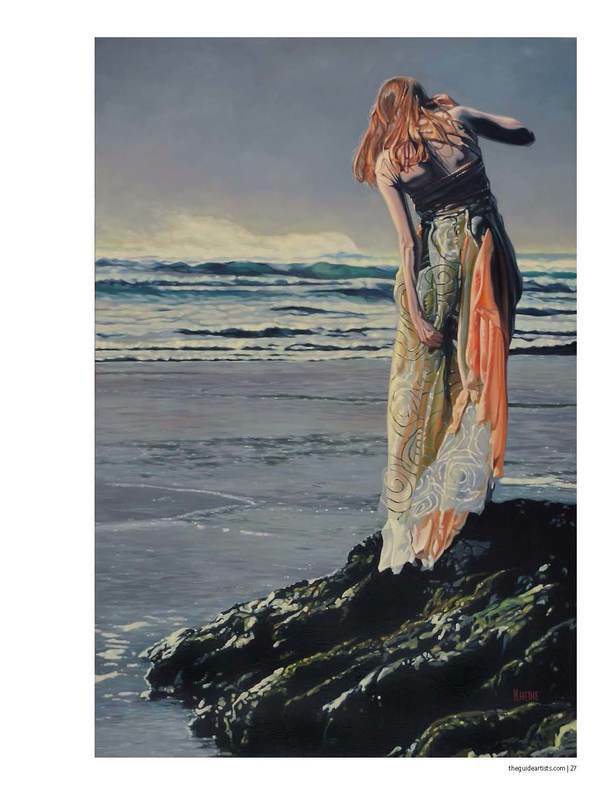 Each of the paintings is a key moment in a book I’ve written and hope to have published, also titled Sirens. 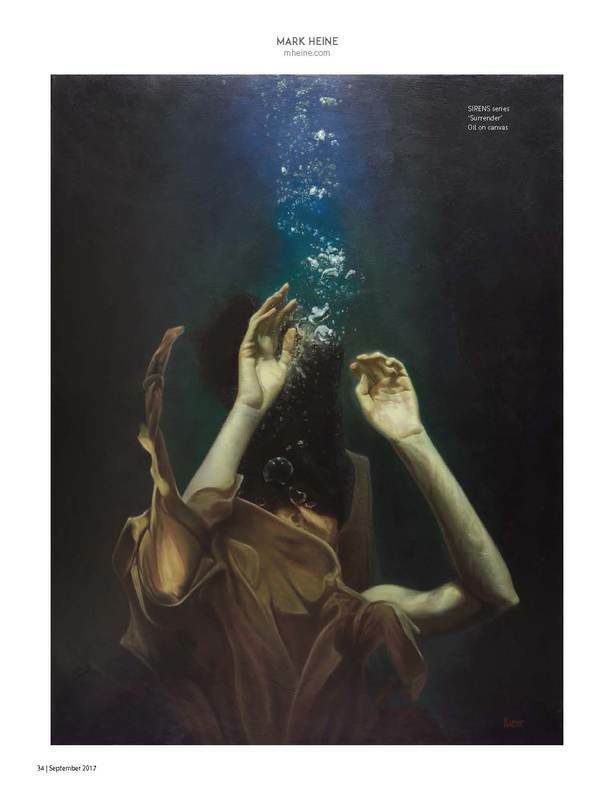 It’s a work of fiction in the genre of magical realism that is intended for young adults. 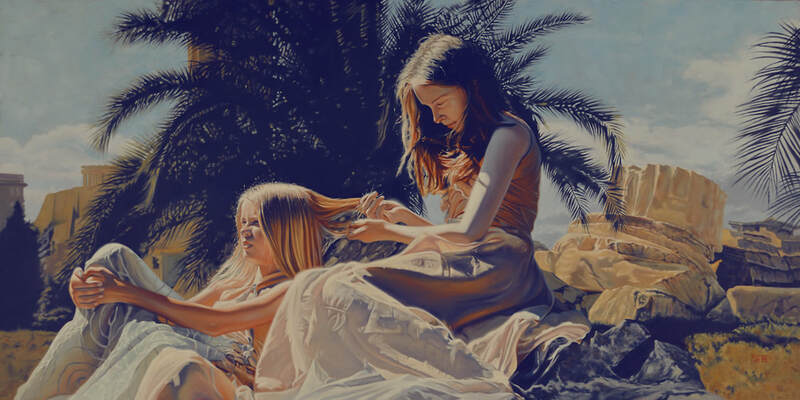 My key inspiration with the book and the Sirens paintings is my daughters – Sarah, who is one of my Sirens models, and Charlotte – and their friends, who are among the generations that will shortly inherit the daunting task of caring for the earth. The paintings and the book are my effort to shine a light on our destructive relationship with the natural world in a way that engages young hearts and minds (and older ones too!). I hope that the story and paintings will help reinforce the message that we are all responsible for environmental stewardship and sustainability, and we ignore or deny that at our peril. I have always had a keen interest in writing, and combining my passion for both painting and writing affords me a unique approach to both. At times, my writing inspires an idea for a painting. 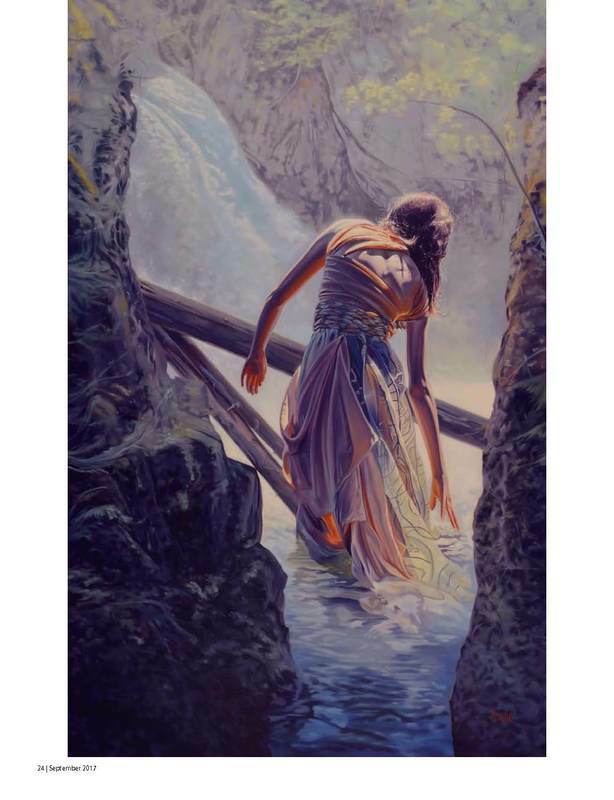 At other times, it’s the painting that inspires my writing. 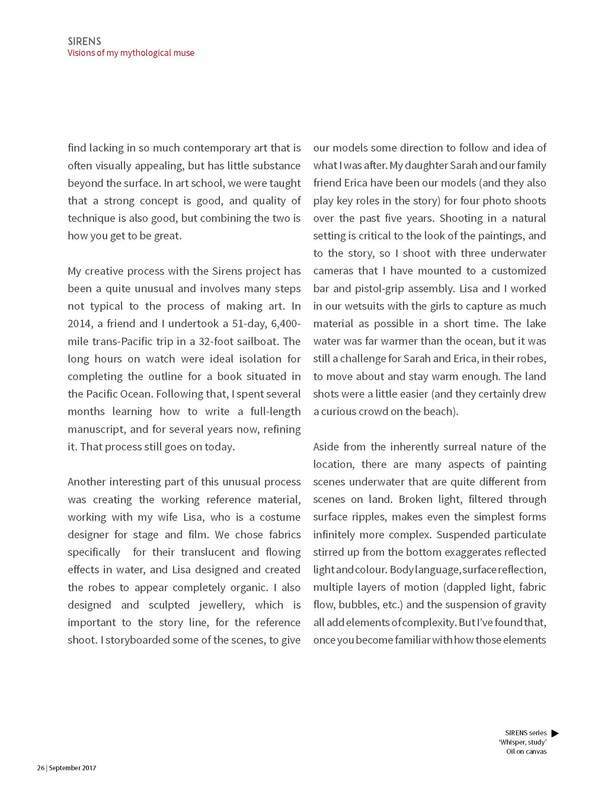 I also find that writing gives my art purpose and a common theme, which I find lacking in so much contemporary art that is often visually appealing, but has little substance beyond the surface. In art school, we were taught that a strong concept is good, and quality of technique is also good, but combining the two is how you get to be great. 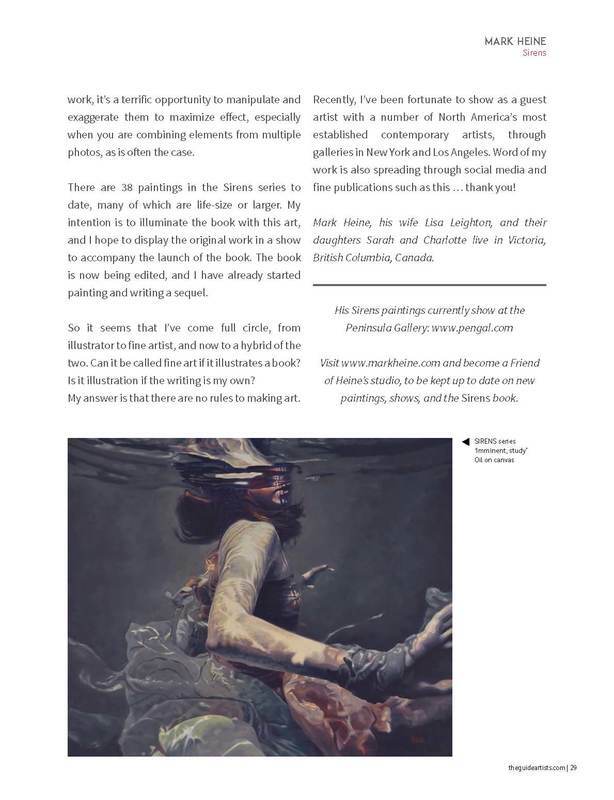 My creative process with the Sirens project has been a quite unusual and involves many steps not typical to the process of making art. In 2014, a friend and I undertook a 51-day, 6,400-mile trans-Pacific trip in a 32-foot sailboat. The long hours on watch were ideal isolation for completing the outline for a book situated in the Pacific Ocean. Following that, I spent several months learning how to write a full-length manuscript, and for several years now, refining it. That process still goes on today. Another interesting part of this unusual process was creating the working reference material, working with my wife Lisa, who is a costume designer for stage and film. We chose fabrics specifically for their translucent and flowing effects in water, and Lisa designed and created the robes to appear completely organic. I also designed and sculpted jewellery, which is important to the story line, for the reference shoot. I storyboarded some of the scenes, to give our models some direction to follow and some idea of what I was after. My daughter Sarah and our family friend Erica are our models (and they also play key roles in the story) for four photo shoots over the past five years. Shooting in a natural setting is critical to the look of the paintings, and to the story, so I’ve selected a local freshwater lake as our venue. I shoot with three underwater cameras that I mounted to a customized bar and pistol grip assembly. Lisa and I worked with the girls in our wetsuits to capture as much material as possible in a short time. The lake water was far warmer than the ocean, but it was still a challenge for Sarah and Erica, in their robes, to move about and stay warm enough. The land shots were a little easier (and they certainly drew a curious crowd on the beach). 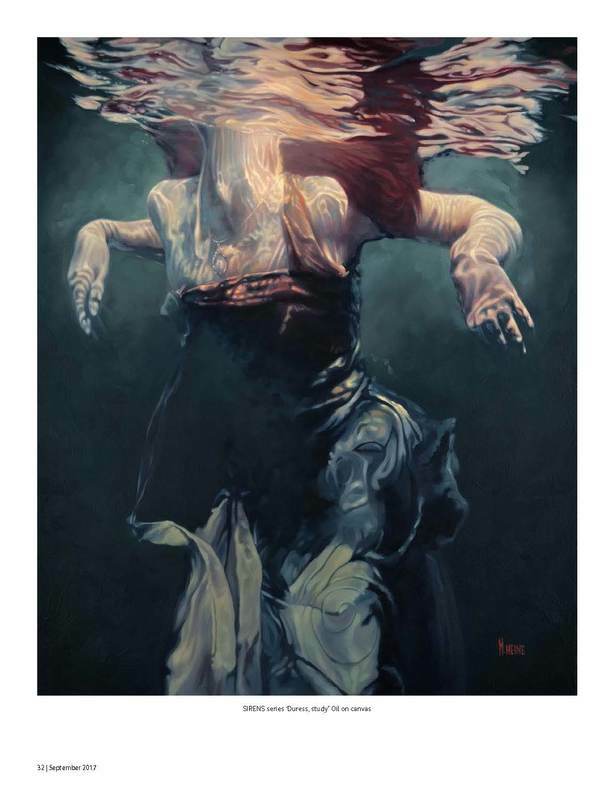 Aside from the inherently surreal nature of the location, there are many aspects of painting scenes underwater that are quite different from scenes on land. Broken light, filtered through surface ripples, makes even the simplest forms infinitely more complex. Suspended particulate stirred up from the bottom exaggerates reflected light and colour. Body language, surface reflection, multiple layers of motion (dappled light, fabric flow, bubbles, etc.) and the suspension of gravity all add elements of complexity. But I’ve found that, once you become familiar with how those elements work, it’s a terrific opportunity to manipulate and exaggerate them to maximize effect, especially when you are combining elements from multiple photos, as is often the case. 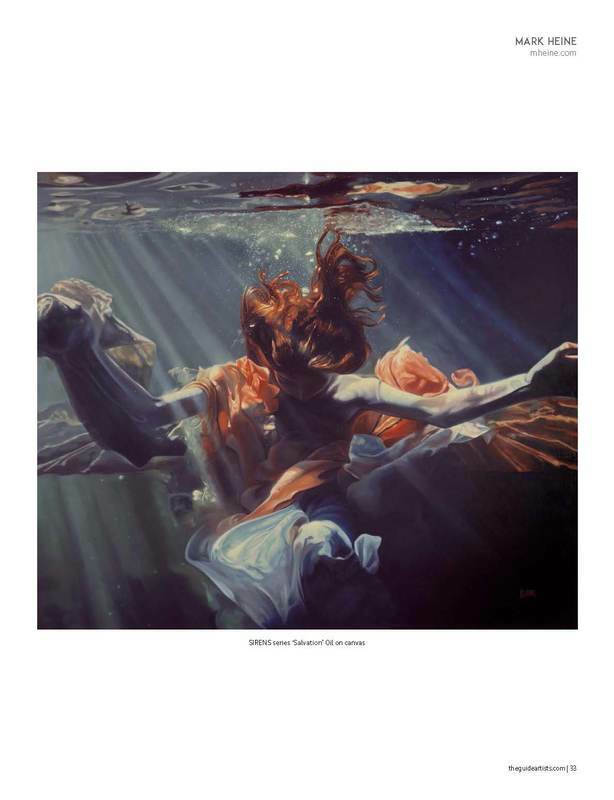 There are 38 paintings in the Sirens series to date, many of which are life-sized or larger. My intention is to illuminate the book with this art, and I hope to display the original work in a show to accompany the launch of the book. 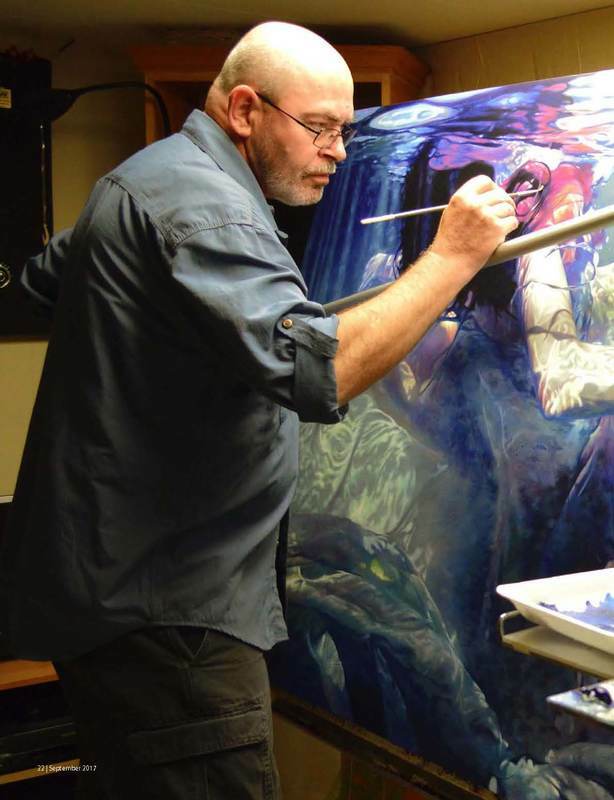 The book is now being edited, and I have already started painting and writing a sequel. So it seems that I’ve come full circle, from illustrator to fine artist, and now to a hybrid of the two. 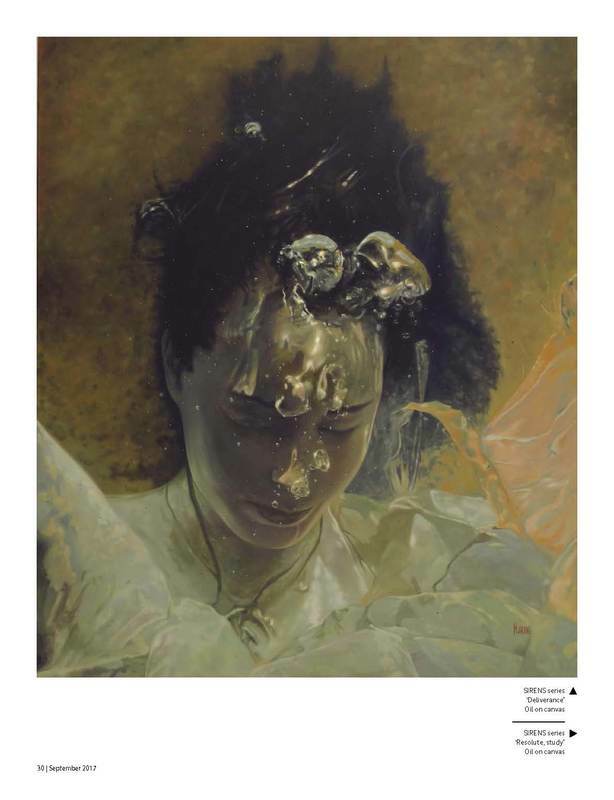 Can it be called fine art if it illustrates a book? Is it illustration if the writing is my own? My answer is that there are no rules to making art. Recently, I’ve been fortunate to show as a guest artist with a number of North America’s most established contemporary artists, through galleries in New York and Los Angeles. Word of my work is also spreading through social media and fine publications such as this … thank you! 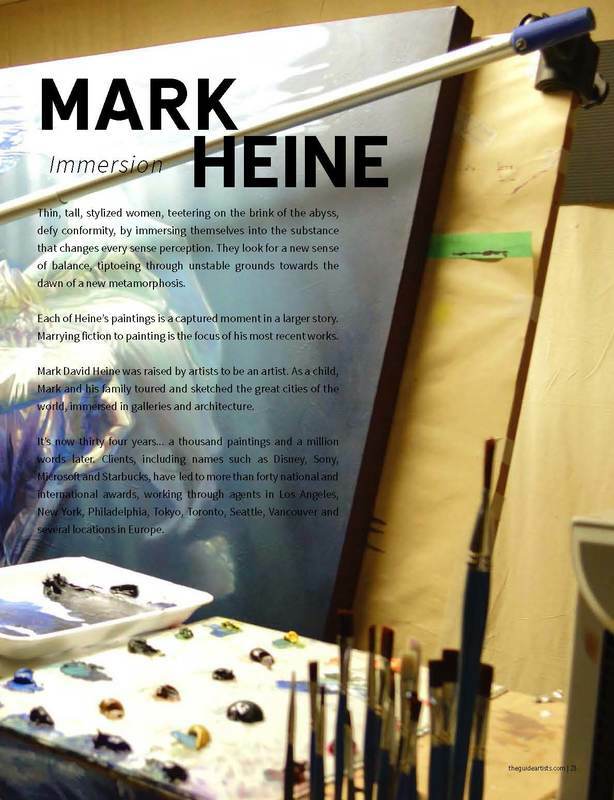 Visit www.markheine.com and become a Friend of Heine’s studio, to be kept up to date on new paintings, shows, and the Sirens book. This magazine is available for purchasing in both digital and print formats.